First Lady Melania Trump participated in the annual Toys for Tots toy drive at Joint Base Anacostia-Bolling outside Washington, D.C., this week. The stop was just one on a tour-de-force of military and charitable visits by the First Lady as a part of the holiday season. The Toys for Tots toy drive Melania visited earlier in the week is part of an annual drive is hosted by the United States Marine Corps Reserve and has been regularly attended by the first lady in recent administrations. Toys for Tots distributes new toys to needy children around the country. The charity is often supported by the military and law enforcement. 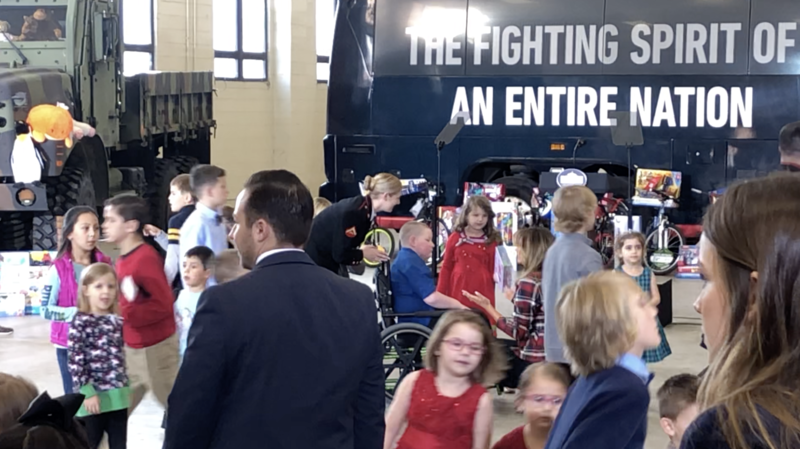 The first lady delivered brief remarks to a hangar full of children and their enlisted parents on the military base Tuesday afternoon and then led the children to giant tables full of toys for sorting. These are the toys that will be delivered to the needy children. The sorting process involved the first lady and approximately 100 little children putting the toys in boxes. During one such exchange, Melania stopped to speak with a young boy in a wheelchair. The First Lady spoke with the young boy for some time and it became clear that he was non-verbal. The boy was signing to the First Lady emphatically. Melania speaks five languages but sign language is not one of them. In spite of this, Melania listened and interacted with the boy lovingly. She spent over a minute kneeling down to his level and “listening” to him – often reaching out to touch his hand and arm to let him know she was “hearing” him. Melania eventually left the boy’s side to go and write Christmas cards with the other children. Braydon mother told the Daily Caller it was an “honor ” to watch the First Lady interacting with her son. She has had some other heartwarming exchanges as she has interacted with service members and their children at the base. “The First Lady will be gifting 100 books to the Toys for Tots Literacy Program. Since starting in 2008, the program has distributed over 39 million books to less fortunate children, helping to reduce the illiteracy rate among children. Mrs. Trump will also be giving Be Best totes filled with a coloring book and White House candies to all the children that will be helping out at the drive.